How to install APK on my Android device? Before you make sure your device has enabled the "3rd party apps". To check this, go to: Settings, Security, and unknown sources. 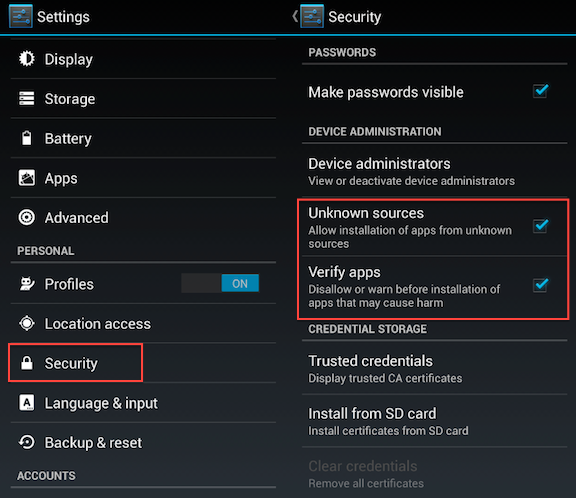 These "unknown sources" are simply applications that come from another source that is not the Android Market. How to Install APK from SD card? Step 1. First you have to download the APK file and put it somewhere on your PC where you can find it easily. Step 2. Connect your device to your computer using the USB connector. Step 3. Make sure your device connection settings are correct. To check this, go to Settings, Connect to PC, Standard connection, and mass storage unit. NOTE: Sense HTC users may have to wait up to a minute until the mass storage device is visible on the computer. Step 5. Safely disconnect the device. Step 6. Open a file browser such as Winzip, FileBro or File Manager (you can find any of these file browsers in the Android Market). Step 7. Search the APK file that you put on your SD card, click it and then press Install. Step 8. Read permissions and install application.